The debate around fluoride in drinking water continues to be hot news. Cities and towns are now trying to opt out of fluoridating water. Many say the adverse health effects of drinking fluoride over the long term far outweigh any benefits that might be gained. As towns have taken a stand against fluoridation, dental organizations are fighting back. Now, some dental professionals are coming forward and saying that drinking bottled water could put kids at risk for tooth decay. Many households have switched to bottled water after reports of chemicals being found in tap water. By some estimates, there are as many as 2,000 different types of toxic chemicals that can show up in tap water. Pollution is one cause of this toxic overload. Other sources of chemicals include those added by public water companies, such as chlorine. Chlorine is added to tap water to kill potentially life-threatening bacteria. Over time, chlorine could up your risk for heart disease, cancer, and other health conditions. Pesticides and fertilizers are also added to water treatment plants to kill off parasites that may be living in the water. These parasites are dangerous, but so are the chemicals used to eliminate them. Faced with the choice of drinking tap water laced with chemicals or bottled water, it makes perfect sense that many people choose the latter. But what about the issue of cavities—is drinking water free from fluoride hazardous to your teeth? Dentists are pointing to a rise in tooth decay in children. Many blame bottled water for the increase in cavities. Not only are there more cavities, some dentists are saying, but the cavities are more severe too. Those taking less of a hard line towards bottled water say that drinking it is fine but extra care needs to be taken with teeth. People who drink bottled water and lose out on fluoridation should avoid eating sticky, sugary treats. These foods will promote the growth of bacteria that triggers tooth decay. Daily brushing and flossing is a must. Even bottled water is not necessarily what it seems. Bottled water can also contain contaminants. Some brands of bottled water are better quality than others. Everyone’s heard the story about the bottled water that is nothing more than tap water. One compromise that might keep everyone happy is to drink some of both. Take bottled water with you when you go out and/or participate in physical activity. When you are at home, drink some fluoridated water to boost protection of your teeth. A good toothbrush and effective dental floss can go a long way when it comes to keeping your teeth healthy. Get regular dental checkups to remove tartar build-up. If you would like to avoid bottled water and tap water, you can try drinking filtered water. Filters are meant to remove chlorine and other toxic chemicals. Rogers, K., “Bottled water puts children at risk for tooth decay, former ODA president says,” CBC Hamilton web site, Oct. 21, 2013; http://www.cbc.ca/news/canada/hamilton/news/bottled-water-puts-children-at-risk-for-tooth-decay-former-oda-president-says-1.2129398, last accessed Oct. 23, 2013. 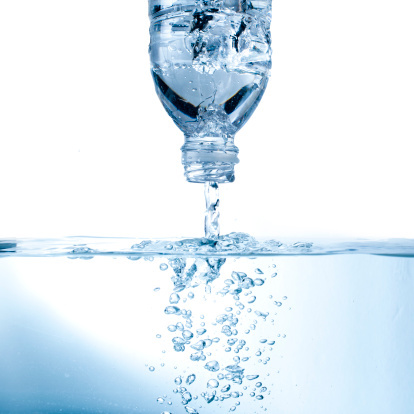 “Frequently Asked Questions about Bottled Water,” Health Canada web site; http://www.hc-sc.gc.ca/fn-an/securit/facts-faits/faqs_bottle_water-eau_embouteillee-eng.php, last accessed Oct. 23, 2013.